More people are doing their own remodeling, repairs, maintenance, landscaping, and construction projects inside and outside the home. Safe Electricity urges all do-it-yourselfers to take precautions, especially when working around electrical equipment and overhead power lines. Make sure outdoor outlets have a ground fault circuit interrupter (GFCI). Use a portable GFCI if your outdoor outlets don’t have them. It’s also a good idea to have GFCIs professionally installed in wet areas of the home, such as the kitchen, bath, and laundry. Look up and around you. Always know of the location of power lines, particularly when using long metal tools, like ladders, pool skimmers, and pruning poles, or when installing rooftop antennas and satellite dishes or doing roof repair work. Be especially careful when working near power lines attached to your house. Keep equipment and yourself at least 10 feet from lines. Never trim trees near power lines — leave that to the professionals. 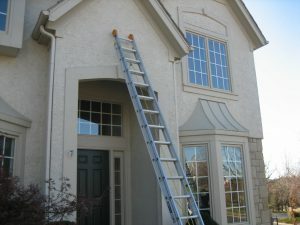 Never use water or blower extensions to clean gutters near electric lines. Contact a professional maintenance contractor. If your projects include digging, like building a deck or planting a tree, call the national underground utility locator at 8-1-1 before you begin. Never assume the location or depth of underground utility lines. This service is free, prevents the inconvenience of having utilities interrupted, and can help you avoid serious injury. Always check the condition of cords and power tools before using them. Repair or replace worn or damaged cords and tools. Electricity + water = danger. If it’s raining or the ground is wet, don’t use electric power or yard tools. Never use electrical appliances or touch circuit breakers or fuses when you’re wet or standing in water. Keep electric equipment at least 10 feet from wet areas. Make certain home electrical systems and wiring are adequate to support increased electric demands of new electric appliances, home additions, or remodeling projects. An older home may be inadequately wired for today’s electricity consumption, putting your family at risk for fire and electrical shock. Have a professional replace worn and outdated circuitry and add outlets for appliances and electronics – this is not a job for casual do-it-yourselfers!